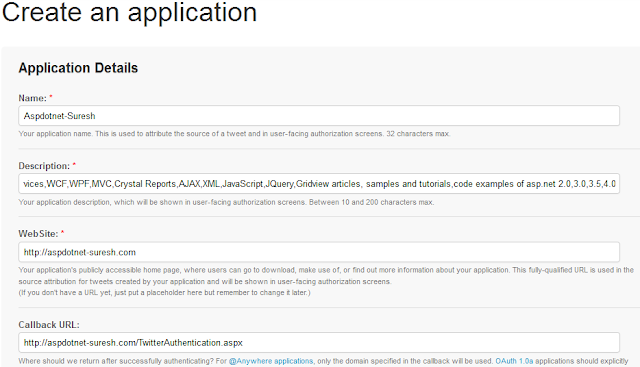 In this article I will explain how to create app in twitter and implement twitter login authentication for website in asp.net. In previous post I explained article how to integrate facebook login authentication for website in asp.net. 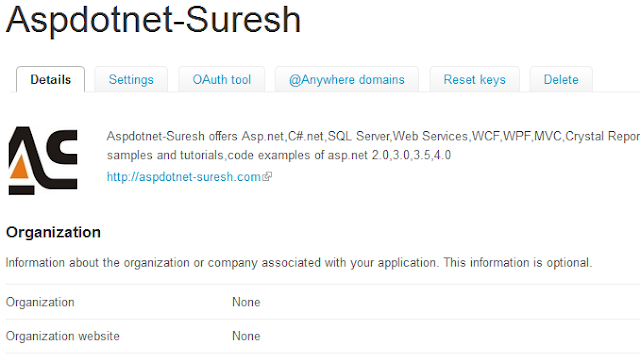 Now I will explain how to allow users to login with twitter accounts in website using asp.net. Once app page opened enter Application Name, Description, website (Ex: http://aspdotnet-suresh.com) and callback url details and click create new application button and here one more thing we need to remember is twitter won’t support for localhost sites (ex: http://localhost/Default.aspx) because of that we need to give hosted domain site url. //Get the access token and secret. //We now have the credentials, so make a call to the Twitter API. //Redirect the user to Twitter for authorization. //Using oauth_callback for local testing. Thank you very much,but have can I get the user mail address? http://api.twitter.com/1/account/verify_credentials.xml. The response contains the user id, screen name etc. but not the email ID. Is it possible at all to retrieve the email ID of the user? Hey Suresh good example, I did the same thing and am getting a 404 exception. Not sure whats wrong though..
Yeah ,it doesn't work anymore I guess something changed by twitter. after this line I get 404 error. back as I'm looking to create my own personal website and want to learn where you got this from or what the theme is named. Thanks! you can get <add key="consumerKey"
Server Error in '/ThanthiTv' Application. Exception Details: System.Net.WebException: The remote server returned an error: (404) Not Found. It doesn't work it gives error 401 ... Any solutions,Please? this works for me . how to get user email from api? The remote server returned an error: (407) Proxy Authentication Required. what is the problem ??? Follow "R koyee" comment above. It worked for me. http to https. Nice work Suresh. Without login in twitter,posible to get tweet information using email addredd in asp.net. with the use of email address i want to show user profile details & user tweet in my web application. I create application in twitter for getting api key. but every time need to login with application.it is not good for me. So please any idea about how to get those information without login. throw;//ih this line error is showed error 401. Code is working fine for me and I am getting data from twitter. But if I refresh the page, its goes to error 401. Any idea? not return and retrieve the TokenSecret. The remote server returned an error: (401) Bad Request. change the following Url to this. your suggestion helps me alot. Dim responseData As String = ""
Catch////in this line error is showed error 401. You have to set value _callBackUrl = "oob" for desktop version (you would get this message if you call parsed URL (WebRequest function) in your browser). Also use "R koyee" advice for url-s. I have an Error "The remote server returned an error: (410) Gone" from last 4/5 days. Hello Sir, It return on my website url with this values "twitter.aspx?oauth_token=TkCDA6rtzr2FD2b8EVmHLR0HN8poqA&oauth_verifier=pQJIWdp7S02QKvrWPDEpKU5FAoxsbTRk"
I have a 401 error too, is someone manage to use this code? 401 error wil be cleared..
how can i get E-mail ID in this application ???? How to add reference of oauthexample in project means using oAuthExample; is giving error. Great @rajeev really it worked for me...! :) thanks a lot! In my MVC website , i want to display 10 latest tweets to the website. How can i do it? Exception Details: System.Net.WebException: The remote server returned an error: (401) Unauthorized. Thanks for sharing your twitter experience with us. It really works for me. Thanks for the valuable sharing. I followed through every discussion post here. Made corrections to the new URL release by twitter, applied JSON etc, and finally got it working. But I have below error. Response.Redirect(oAuth.AuthorizationLinkGet()); giving runtime error that url can not be null. and another problem is how to get _oauthVerifier value? Additional information: The remote server returned an error: (401) Unauthorized. 1.- Putting corretly the url callback. 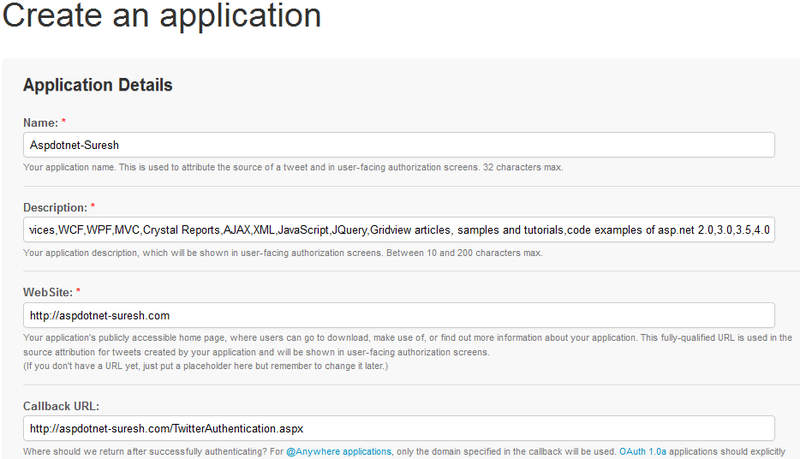 i use @Rajeev solution , still not working, get this error after authorize twitter. The remote server returned an error: (404) Not Found. Twitter has changed its links. Here are the changes to be made. oAuth.CallBackUrl = ""; //put your callback url inside the quotation. hello,Its Give me error while return call back from twitter "Additional information: The remote server returned an error: (404) Not Found." twitter login to website in asp.net possible for local site?if possible please sir give detail as soon as possible.